The fair was an important moment for Chicago. Coming just over 20 years after the Great Chicago Fire had devastated much of the city, it was an opportunity for Chicago to show the world that it was back on its feet and ready to take its place among the great cities of the world. But securing the fair wasn’t going to be easy, as there was fierce competition from New York. Some of Chicago’s leading citizens, such as Marshall Field, Cyrus McCormick and Gustavus Swift stepped up and pledged millions to finance the fair. Their efforts were successful and Congress selected Chicago as America’s host city for the fair. For a venue, the city selected Jackson Park on the south side, and soon the new buildings started to rise. Burnham was selected as Director of Works, and he was determined that sculptures and architecture would dazzle fairgoers the way engineering had astonished visitors to the previous fair in Paris. A carnival midway inspired by Paris’ would be part of the attraction, but so would more than 40 national pavilions, the first such exhibits to be dedicated to individual nations as part of a World’s Fair. Chicago’s World’s Fair was host to a number of innovations. After some construction delays, the original Ferris Wheel was first displayed there, going on to become a mainstay of fairs and carnival midways. The 1893 exhibition was also the debut of the travellator, a moving walkway which carried passengers along a section of the lakefront. The fair also featured scientific lectures, new inventions, native plants to North America which had never been seen by Europeans, and even a Viking ship sailed across the Atlantic as part of the Norway pavilion. More than 20 million visitors made their way to the fair during its run from May to October. While most of the buildings were temporary, some prominent reminders are still in place. The Palace of Fine Arts building was renovated to eventually become the Museum of Science and Industry. The World’s Congress Auxiliary Building became the home of the Art Institute of Chicago. Designers of New York’s Coney Island drew inspiration from some of the attractions of Chicago’s fair. 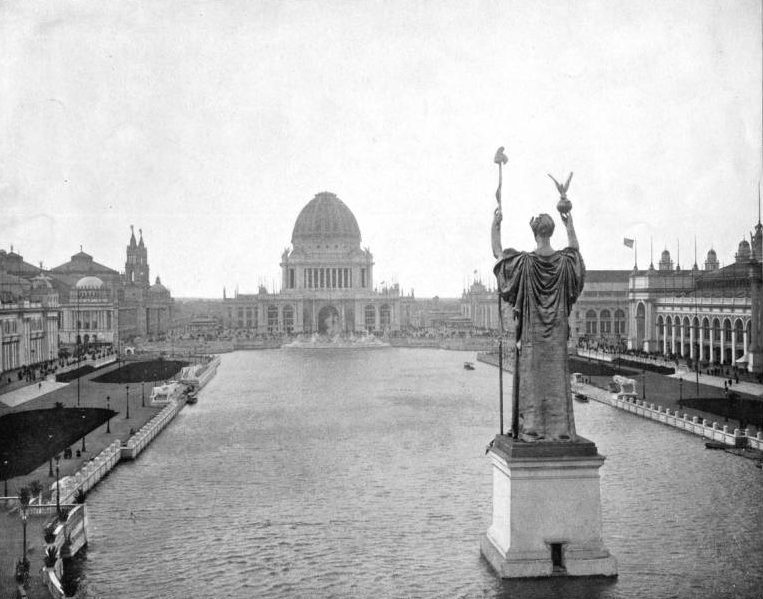 Chicago around the time of the 1893 World’s Fair is also remembered as a venue for tragedy. It was the backdrop for the serial killer H.H. Holmes, who was the subject of Erik Larson’s 2003 best-seller Devil in the White City. Tragedy struck again on the closing night of the fair as Chicago Mayor Carter Harrison, who had just returned home from delivering his remarks at the fair’s closing ceremony was shot and killed by a failed job seeker. Forty years after the World’s Columbian Exposition, Chicago would play host to its second World’s Fair: the Century of Progress Exposition. Noting the time between the two fairs, organizers came up with a dramatic opening for the 1933 event. Around the time of the closing of the 1893 fair, light was leaving the star Arcturus, the brightest star in the Northern celestial hemisphere. Arcturus is far enough away from Earth that it was estimated that this light would arrive on Earth after 40 years. When Arcturus was detected in the sky on opening night in 1933, the light which had left the star in 1893 was said to have been converted to electricity by several astronomical observatories, transmitted to Chicago and used to trigger the lights of the 1933 World’s Fair. Digital Archives - A service of the IL State Library & IL Secretary of State. The Century of Progress World’s Fair was an even bigger production than the World’s Columbian Exposition had been. Spread out over two years, the fair opened on May 27, 1933, and ran until October 31, 1934, closing down for the winter in between. This expo drew close to 40 million visitors, including President Franklin D. Roosevelt, and it took its name from the celebration of the 100th birthday of the City of Chicago that year. This time, the World’s Fair would be closer to downtown: it was located on Northerly Island, which would later become the site of Meigs Field. 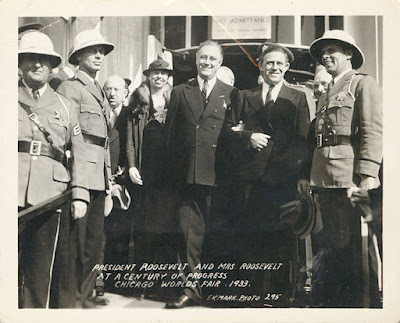 When planning for the fair began in the 1920s, Chicago had a powerful backer: Charles Dawes, Vice President of the United States and recent Nobel Peace Prize recipient for developing the Dawes Plan for reparations from World War I. He became the finance committee chair. His brother, Rufus Dawes, who had made his fortune in the oil business, chaired the exposition board. Local investors put together funds to get the bid off the ground. By the time the fair was over, its costs had exceeded $100 million. The fair provided an opportunity to boost spirits during the Great Depression. The theme for the fair was “I will,” and it would again focus on scientific progress. Its motto would be “Science Finds, Industry Applies, Man Conforms.” Chicago’s leading architects of the day were again called upon to design the fair’s buildings, but this time they went in a different direction. Rather than the “white city” theme that had dominated in 1893, the Century of Progress Exposition buildings featured bright colors. Soon the buildings were brought to life by scientific exhibitions and other examples of science and industry coming together to improve the quality of life for modern citizens of the world (and to showcase new products for consumers to buy). Admission was just 50 cents. Innovations included the “Skyride,” an elevated ride strung between two towers, and also the world’s largest fountain. A popular exhibit was the “Homes of Tomorrow” display. General Motors showcased its assembly line technology, and it was such a hit during the first year of the fair that Henry Ford insisted on having his own display during the second year. That summer, Chicago hosted the first Major League Baseball All-Star Game at Comiskey Park. The Burlington railroad’s Zephyr amazed spectators when it dashed in from Denver on May 26 after a 13 hours 5 minute overnight run, arriving for the “Wings of a Century” transportation pageant. The Century of Progress World’s Fair did not leave the same legacy as the World’s Columbian Exposition. None of its buildings survive today, and the land used for the fair eventually became Meigs Field and McCormick Place. After it was over, some of its exhibits went on display at the Museum of Science and Industry, including the Zephyr. One area in which the fair was unquestionably successful was in helping Chicagoans coping with the Great Depression: the fair employed more than 20,000 Chicago residents who spent two years educating and entertaining guests when the world came to Illinois.